Most of us will remember Shippam’s meat and fish paste – indeed, it can still be obtained today. This jar is another item dug up in the garden which had belonged to village eccentric, Cally Hulbert. Apparently jars of this style were in use from the 1920s until at least the late 1950s. The chances are that this jar was used and discarded by Cally. Our thanks go to the British Antique Bottle Forum (http://www.britishantiquebottles.co.uk/) for their help in dating this bottle. The Shippam Company was based in Chichester. Apparently, the older Mr Shippam was strictly teetotal and objected to his workers drinking. We are told that if he suspected one of his team of imbibing some lunchtime liquor he hauled the person in front of him and made him say, ‘Shippam’s Chichester Sausages’. Seemingly if they could manage that, they were deemed OK, but if they couldn’t say it clearly they were in trouble. As a final thought, the person who found this jar thought it was very ordinary and said, ‘You won’t be interested in that, will you?’ Well of course, we can’t keep everything but ordinary things from living memory do need keeping. And museum visitors love saying, ‘Ooh, you’ve got one of them. I remember them.’ So yes, we were pleased to receive the jar. This entry was posted on February 29, 2012 at 6:04 am and is filed under Museum. You can follow any responses to this entry through the RSS 2.0 feed. You can leave a response, or trackback from your own site. I can remember as a kid at Sunday tea Shippams Fish paste was quite common on our table and on special occasions we had meat paste. Splendid, Danny. I agree – it’s a lovely item of no cash value at all, but who cares. Thanks for this post. I found an identical jar while scuba diving off of the old pier in St. Croix, USVI today. It’s always fun to know where things like this came from. I have a lovely A3 (guess rough size) Shippams advert from the 1930s, really art deco in design , with a flapper girl in a bathing costume, original advert, and i love it, I do bottle digging and come across all sorts of meat paste pots, and have now started to collect them as they too are a part of our social history which has been overlooked for far too long .cheaqp, and easy to find and collect, with the advertising, would make a interesting collection. I couldn’t agree more, Chris. I should say you’ll have a really worthwhile collection. Maybe you’ll research the history one day. Our jar has become the most looked at individual item on the museum blog. It proves there is real interest in them. The jar that you found was filled on a hand filler there is one from shippams in Chichester museum. Thanks Chris. Always good to know more. Sorry – no real knowledge. Ours was just found and we were surprised how little information was ‘out there’. Just found a Shippams bottle in our garden along with glyco thymoline mouth wash , pinoleum (olbas type), scrubbs fluid and a poison or medicine bottle with teaspoons written on plus measurement lines. Our house dates from 1907. Gosh! How lucky you are. If you want to know more about your finds try http://www.britishbottleforum.co.uk/ They sort out most of my needs. Hi I have 5 of this jars. They been bered in my garden for long time. Can i sell them? And how much they will be. Thanks. We have no interest in cash values but suspect such jars are worth approximately nothing. If you really want to find out offer them for sale on Ebay or any other auction. I have many Shiipham’s Meat and Fish paste jars. Since Aug 14th this year I have been digging up bottles on a Small scale Domestic tip/dump , local to me. Every time I dig a new hole , it is 95% likely I will dig up a Moulded glass Shippham’s paste jar. They date from the 1920’s – 30’s and are often in Mint condition due to this Tip being Previously unknown until I found it. Unfortunately as pretty as Meat and Fish paste jars can be, and the various different mould shapes. They are pretty much worthless. And it’s a damn shame because these Diddy jars can be some of the prettiest pieces of glass you can find . I agree they are lovely – but also very common which I suppose limits value. At a museum cash value is not of much interest to us. What we care about is the local provenance. They are appreciated by many. Our page on the Shippam’s jar is one of the most visited single pages on the blog. Hugh found the same jar while rooting about on Burgh Island here in Devon. The hotel on the island has so much history and it obviously was discarded in those interwar/postwar years by either some bright young thing or some other person of the period. There are probably loads around the island – not discovered yet. No recycling in them days; straight to the island tip although then of course there would be no plastic. Dinky thing it is with a circular space on the back for a label. Worthless really but we’ll keep it as a pretty gewgaw. All love from Hugh at Bigbury on Sea. your time, efforts, and insight! We don’t buy things at this museum so havwe never looked into availability. But they were made in millions so they will be about somewhere and ought to be very inexpensive. Hi there, my daughter has just found one of these whilst digging in the garden. Any advice on what we could do with it ? Nothing beyond using it as a little vase. They have no value. Enjoy it. We think they are lovely jard but of no value, of course. Found one in the bush today ( 31/08/2016) – Tinonee, NSW, Australia, while walking the dog. The bush was used as a dumping ground in the early years. Sadly today it still is. Very interesting history to this bottle. Clearly an international item. We have the same problem here in the UK with people fly tipping. Found one while digging around a basement for weeping tile work in Thunder Bay, Ontario Canada. The site of the house was ontop of an old dump site back when our city was two towns. The dump site was turned into a small subdivision of housing back in the 1970s and we found all kinds of interesting things digging around the foundation walls, one being this bottle. Wonder if they were ever produced in Canada? I’ve just found of these bottles sticking out of the edge of a water filled pot hole in a green lane near Exmoor National Park. The track is used by 4X4’s to link up farms. All I saw was the word Ship on a piece of glass. Curiosity made me dig it out. I was surprised to find it was a whole bottle. It was obviously thrown in with the rubble chippings before they were used to surface the track at some time. Thanks to the website for the information about the bottle. This one has the number 26 on it. I wonder how long it would have lasted vulnerable to the 4×4 wheels. It made walking my Border Collie in falling snow well worth it just to learn something new. Empty Shippams paste jar used upside down in the middle of the meat pie to hold the pastry top up by both my grannies in the UK early 1950’s. Now a Kiwi. Hi me and my friend went bottle hunting and found the exact same but in way better condition what should i do with it? Whatever you like. It’s probably not at all valuable as there are so many of them about. 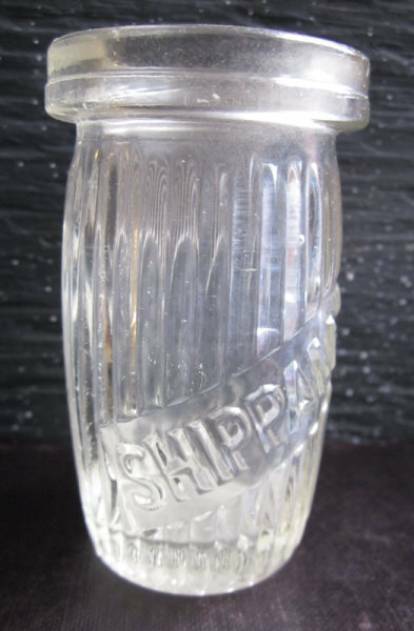 I found one of these exact Shippam’s glass jar in my back garden near Wymondham, Norfolk yesterday [16/6/18]. I was digging a big hole to install an in-ground trampoline. Next to it was a small oval shaped white glass pot with “Ponds” written on the bottom. The house was built in the late 1980s on previously agricultural so how they got there and alongside each other is anyone’s guess. Maybe a farm worker who likes beef paste and well cared for skin!